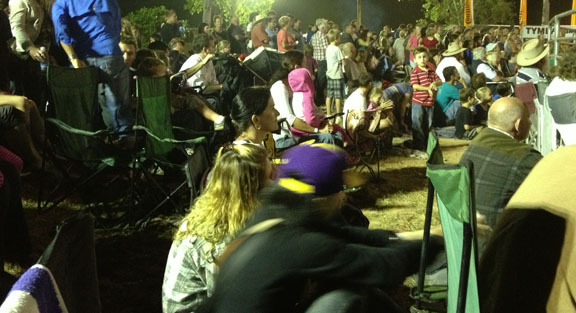 This weekend is a very busy weekend in Broome. 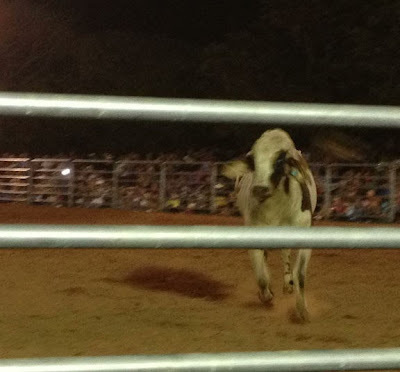 Last night the Broome Rodeo was on. This night is the last of six Rodeos in the Kimberley for the 2013 season. So off we went with our chairs and warm clothes on, to watch the Rodeo. I think everyone from the district was there too. There were thousands of people there and we were cramped in the dust with them. But it was great, so much fun. I didn't think I'd ever like a Rodeo as I don't like to think the animals might get hurt. 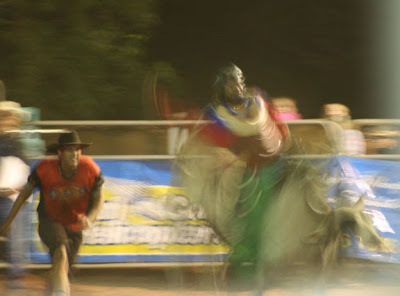 But from what I could tell the cowboys came off second best and I found myself barracking for the horses, calves and bulls. To start the evening off they had the little (and I mean little) kids riding the poddy (see note below) calves. Well they weren't really riding they were sort of being held on the saddle and then lifted off when the time was right. I couldn't believe how little some of the kids were. Get a load of this little fella, he was only 4!! He had just completed his ride!! Part off the crowd just next to us!! this one gets the motion of the bull. The clown in the red shirt behind was amazing. 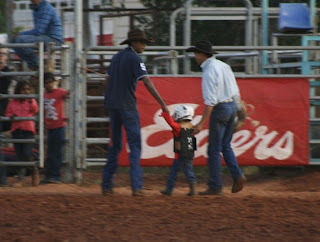 If the cowboy was in any danger he would just put himself between the bull and the rider. Not Happy - He even tried to jump the fence!! We had decided prior to going that we would have something for our dinner there. But there were so many people there the lines for the food stalls were 50 plus people long. 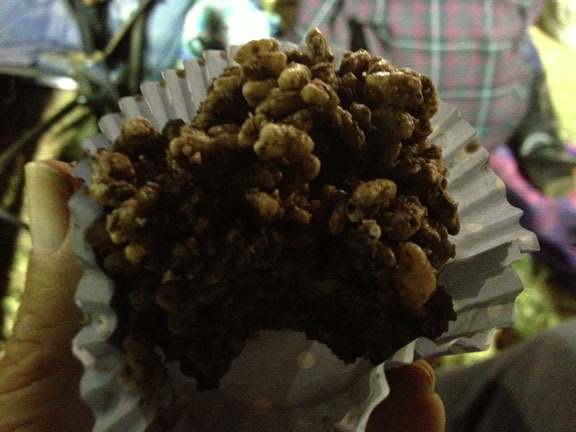 So my dinner was a Chocolate Cracker, small but yummy. Hows this for a nice healthy dinner?? 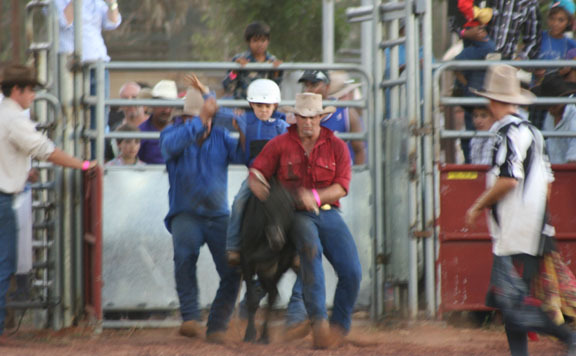 Today was another huge day for Broome as it was the Broome Cup. As horse racing is really not my thing Shane headed off on his own, while I had another day doing Davine stuff. I wandered around the shops, went to the market and sat around the camp playing on my laptop and listening to a great YouTube presentation by Wayne Dyer, Power of Intention Part 1. My favorite quote in it was "Don't Die with Your Music Still in You". Note: Here's a bit of trivia I learnt. A Poddy Calf is an orphan calf. In instances where a calf loses its mother it is commonly reared by hand or with another foster cow. Although in most cases this phrase is used to describe a generic calf. Have never been to a rodeo. They tend to be more popular in western Canada. Those bulls look pretty rowled up! I see I have some catching up to do here! lol Where has the summer (here) gone!! I didn't think I would enjoy the Rodeo as much as I did Jim.